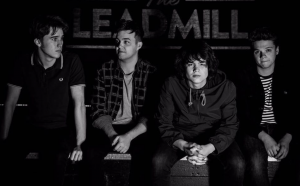 Sheffield’s very own garage pop four piece, comprising of Harry Lyon (vocals/guitar), Isaac White (bass/ backing vocals), Ryan Laycock (guitar/backing vocals) and Charlie Yapp (drums/backing vocals) saw the release of their latest single ‘Messed up Feeling’ on 16.3.18. However, that was never all that was being offered! A music video has been on the cards for a while now and we have some exciting news to share. Red Faces’ music video for ‘Messed Up Feeling’, directed by the amazing Cuckoo Films, is being showcased at the Showroom Cinema in Sheffield on Tuesday 17th April. Cuckoo Films announced ‘We are proper buzzing about this’ and Red Faces were keen to tell us more. So, how did the initial idea come about? After a week of fettling away in studio, recording the song, we started to brainstorm ideas about what the visuals could look like. We’ve always been a fan of the Monty Python/ slapstick style sketches, so we knew instantly we wanted to take inspiration from that. A few terrible ideas later, we thought about taking the classic romance theme of boy chases girl, but then adding a comedic twist at the end. From that idea, it snowballed into what it is – from the help of Cuckoo Films of course. The film follows a geeky Sheffield lad (much like ourselves!) through a series of Sheffield backdrops and odd situations, as he tries to return a lost phone. The premise is that the protagonist will go to any length to return the phone – so far that it becomes almost unbelievable! To us, the the film adds a whole new dimension to the track. It takes the message of the song and compacts it into something which can be easily understood with just one watch. It ties the metaphorical bow on the present of this track very nicely! Why do you enjoy working with film? Personally, I have always been involved in making videos, whether it’s been little silly things or tour videos for the band. I love the feeling of finishing a project and putting it out into the world. So when we were given the opportunity to be involved with Cuckoo Films, I was very excited! What was it like working with Cuckoo Films? It was a dream! Throughout the whole filming process, there was a lot of talking and throwing around of ideas. This resulted in a music video that conveyed our idea perfectly! Helene really understood our vision and her videography was beautiful! So far the response has been positive – thank god! Fortunately, the jokey nature of the film fame across well! We just wanna say a big thank you to Cuckoo Films. I look forward to hearing how the screening goes on Tuesday – good luck!